Precious metal contacts and precision stampings specialist, Samuel Taylor Limited (STL), celebrating its 120 year anniversary in 2015. While the rail industry is striding forward these days, there is still alot of older kit out there, and a partner with a long experience and expertise can be hard to find. The accumulated know-how dating back from the relatively recent 1970s and 80s, can save the rail subcontractor thousands of pounds on refurbishment projects. Many of the relays and mechanical switches are still in use but not many of the original supply chain manufacturers are still around. STL’s tool storage racks run through the era of British Rail to the modern day, and could save a significant amount of time and money for rail subcontractors tasked with refurbishing power switches and associated metal contacts and components. Typical refurbishment projects can require only a couple of hundred parts. But if a new design is needed, no need to look elsewhere, STL’s Sales Manager Carl Siviter comments, “it wasn’t fashionable in recent years to do both small volume and high volume manufacture in UK, but we decided to hold on to both, and it’s been a good decision. Our toolroom and design office integration further strengthen our competitiveness in niche markets, tailoring the engineering approach for the customer’s need and budget”. Exhibiting at this year’s Railtex show in Birmingham, STL is particularly aiming to forge new connections with rail subcontractors who need access to the company’s knowledge and capability in electro-mechanical switches and contact materials. 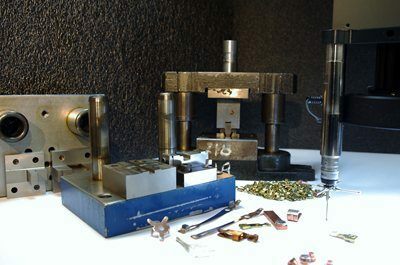 With their precious contact materials potentially fitting a wide range of switches that can be found in train engines as well as the carriages, the firm’s tools and expertise are likely to help rail engineers to carry out rail refurbishments in the most efficient and cost effective way.